I gather that most members here have at least three rats, and I find it hard enough to give equal attention to my two, especially since I have one outgoing boy and one shy boy. How do you avoid favouritism? Or do you just accept that some of your rats crave your attention more than others? Just handle them both plenty, they'll be fine. I have favourites It's natural too, and I don't try and avoid it. Having said that, I don't show favouritism i.e. give the nicest bits of food to the ones I like best etc. eta - food that's in a human's mouth or their hand for human-eating is The Best Thing Ever. Grr lol. I have 5 boys now, and I do have favourites, but it also changes depending on who is up to what!! That being said, Boo is such a lovely licky boy, and he probably gets slightly more attention when theyre out because he comes looking for it.. I am not sure how long you have had Kanda for, but my two new boys hated being picked up and handled and would always try and scramble back to their cage if I had them out in room with cage. So, I started um, popping them down my top, and walking around house with them. They are much more settled now, and can have cuddles for 30 mins or so. acapae_wolf wrote: I have favourites It's natural too, and I don't try and avoid it. I have 42, and honestly, you just come to accept that some will push themselves forward to be cuddled and gotten out, others have little to no interest in me. I am happy with this. I just go by what they want. I don't force any rats to be social if they don't want to be. All of them are friendly, handlable, perfectly socialised rats. But some are just more into rat company, some are more into human company. I don't force them to be one way or the other. With all but 4 being rescued, some of them have had a bad earlier life, some have had a good earlier life so some are more interactive than others. Rats, to me, are like little people with their personalities. Some are all about interaction, others like their privacy and I respect this. Im not the most social of people either, and wouldn't want someone to force me to be so if I didn't want to be. Rats are smart enough to let you know what they want, so I just do what they tell me! As for favourites, I don't think its a problem to have them, and I think everyone does. It doesn't mean you don't love the others, because I love them all, but some just 'click' with your own needs better than others, just like with people. A rat isn't going to be upset if it isn't your 'heart rat', he's only going to care if it affects the way you treat him. And it doesn't, for me. They're all treated equally. Maybe the 'favourites' get more cuddles, but inevitably, the ones that become my faves are the ones who naturally WANT more cuddles, so its all good! I probably do have favourites, but as Beri says it's just a question of not showing favouritism. Although having a very mixed age group, I almost always have one oldie, and they get a bit more attention, as does anyone on medication - just because they benefit from the mollycoddling. Cuddles aren't really an issue as they all come for them if they want them, and I only have 6 so it's not hard to make sure everyone who wants one gets one. And tbh, it's been made quite clear to me that I'm interesting to climb on (especially if I have food), but not interesting to sit on when there is a room to be bounced round. At the moment, the cage is open, and everyone is on the floor except glurk who just jumped on the sofa, ran across my lap, and took a flying leap onto the coffee table before jumping off the other side onto the floor. Arthur is trying to climb my boyfriend's leg (boyfriend is wearing shorts), Woozle is pottering round the kitchen floor hoping to find something edible, Sausage and Pumpkin are doing something or other behind the sofa, and George is leaping round the floor in giant pop-corny bunny hops in celebration of him being a george and it being a floor. I'm the least interesting thing here . I've never had a solid favourite, and never a "heart rat". I do have favourites, but they change every day depending on my mood so everyone gets a turn at being loveliest! I just had a breakthrough with Kanda- I let him eat yoghurt off my fingers and half an hour later he fell asleep on my elbow. Now I know his weakness I will have to exploit it! I'm going to try baby food as it's low in fat, salt, sugar etc. I don't think I'll ever succumb to GMR. Two rats is plenty!! i try within reason (biting would be a no no, they have to be able to be handled by the vet etc) to let them be who they are. 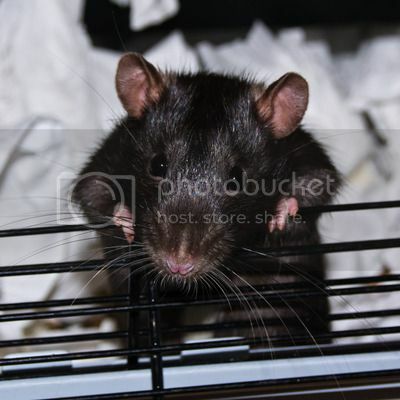 i've had 10 rats now (so i am still a complete novice), whilst i have loved all of them so so much, i have rats that stand out to me for various reasons. 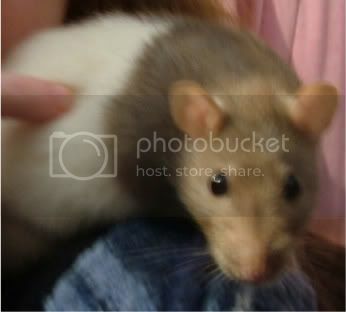 a couple of them i had a very close close bond with them, petal was a rat that will stand out to me till the end. he was absolutely a one person rat (the only person he ever showed particular affection for, other than me, was the vet...but then she is very pretty ) he was my rat, he was absolutely gorgeous, wonderfully eccentric and i miss him unbelievebly. likewise alfie was extremely special and jack was my first rat. i have loved all my rats but i have had rats that were that little more, however despite that they aren't shown favouritism...i keep it fair. however rats are individuals and they need different things. some need more time in certain areas than others. some will throw themselves at you. deimos is a wonderfully licky guy (he's gorgeous and has licked his way into my heart) and needs to give you a thorough groom on a regular basis. elvis is still very timid and needs calm quiet movements. rowan needs playing with every free range and kale needs to be told how beautiful he is and stroked a lot. Hmmm! I said that too, and now I five of them. I would have more too, but my boyfriend won't let me! Sasha & Qudo Maggie & Cassie Abigail, Matilda & Jupiter Anastacia and Greta! I have a favourite . I think it can be hard not to have a favourite to be honest, although my previous two I didnt. Like with people you get along better with some than others and sometimes you just click with one. Theres no favouritism I love them both equally and they get the same treats etc, if I'm honest my favourite does get more attention but thats only because hes far more people oriented then his brother and always wants to be near us, its not a diliberate thing hes more interested in me than his brother.